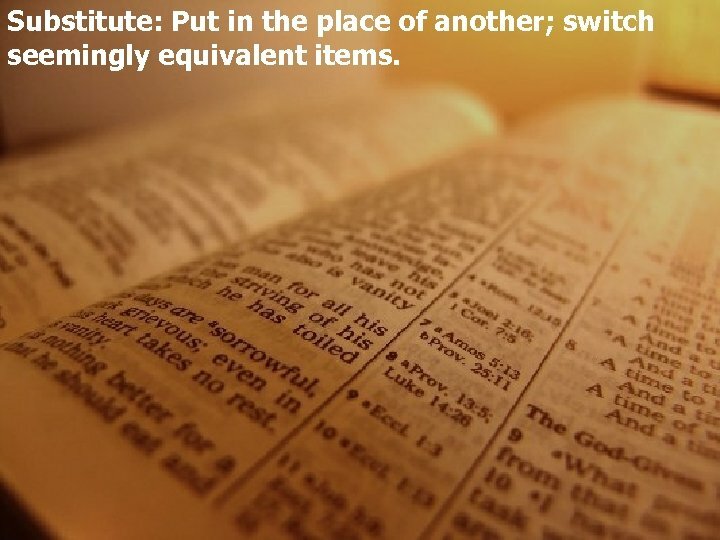 Substitute: Put in the place of another; switch seemingly equivalent items. Genesis 4: 1 Now Adam knew Eve his wife, and she conceived and bore Cain, and said, "I have acquired a man from the LORD. " 2 Then she bore again, this time his brother Abel. 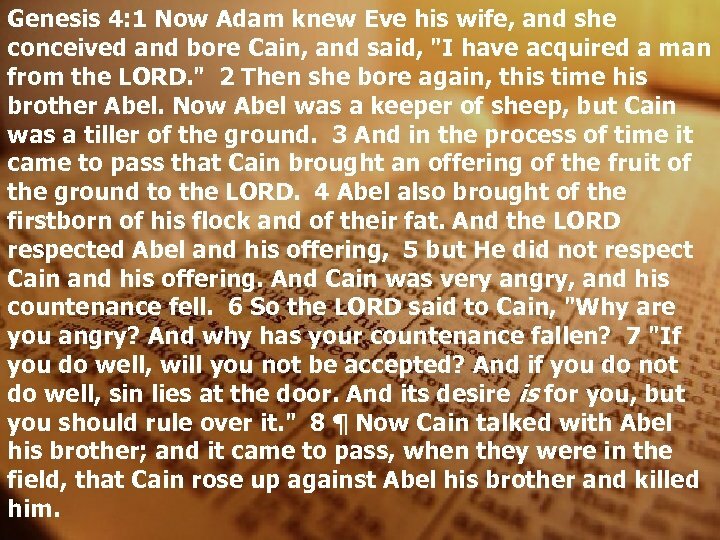 Now Abel was a keeper of sheep, but Cain was a tiller of the ground. 3 And in the process of time it came to pass that Cain brought an offering of the fruit of the ground to the LORD. 4 Abel also brought of the firstborn of his flock and of their fat. And the LORD respected Abel and his offering, 5 but He did not respect Cain and his offering. And Cain was very angry, and his countenance fell. 6 So the LORD said to Cain, "Why are you angry? And why has your countenance fallen? 7 "If you do well, will you not be accepted? And if you do not do well, sin lies at the door. And its desire is for you, but you should rule over it. " 8 ¶ Now Cain talked with Abel his brother; and it came to pass, when they were in the field, that Cain rose up against Abel his brother and killed him. Genesis 16: 1 Now Sarai, Abram's wife, had borne him no children. And she had an Egyptian maidservant whose name was Hagar. 2 So Sarai said to Abram, "See now, the LORD has restrained me from bearing children. Please, go in to my maid; perhaps I shall obtain children by her. " And Abram heeded the voice of Sarai. 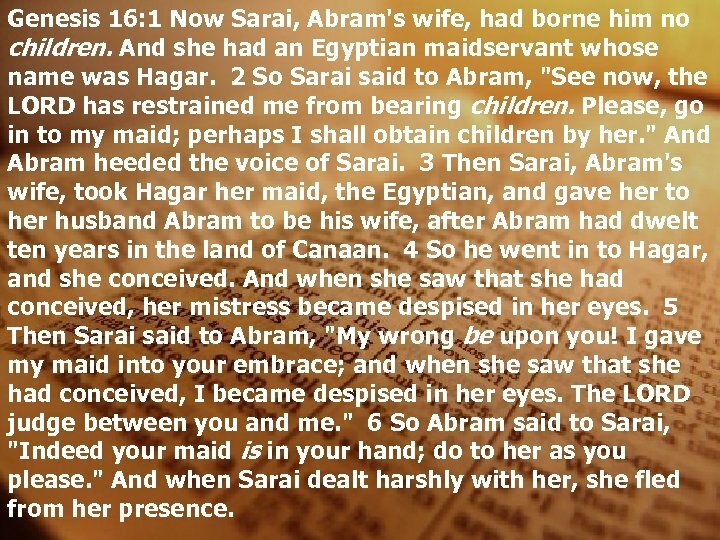 3 Then Sarai, Abram's wife, took Hagar her maid, the Egyptian, and gave her to her husband Abram to be his wife, after Abram had dwelt ten years in the land of Canaan. 4 So he went in to Hagar, and she conceived. And when she saw that she had conceived, her mistress became despised in her eyes. 5 Then Sarai said to Abram, "My wrong be upon you! I gave my maid into your embrace; and when she saw that she had conceived, I became despised in her eyes. The LORD judge between you and me. " 6 So Abram said to Sarai, "Indeed your maid is in your hand; do to her as you please. " And when Sarai dealt harshly with her, she fled from her presence. 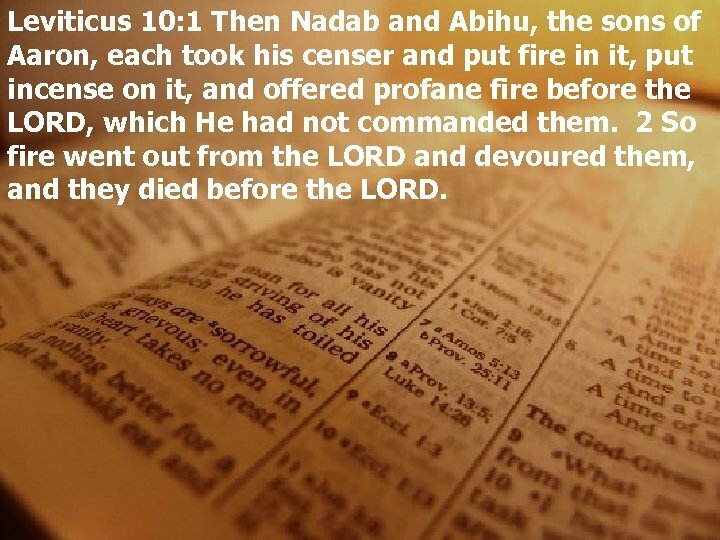 Leviticus 10: 1 Then Nadab and Abihu, the sons of Aaron, each took his censer and put fire in it, put incense on it, and offered profane fire before the LORD, which He had not commanded them. 2 So fire went out from the LORD and devoured them, and they died before the LORD. Leviticus 10: 3 And Moses said to Aaron, "This is what the LORD spoke, saying: 'By those who come near Me I must be regarded as holy; And before all the people I must be glorified. ' 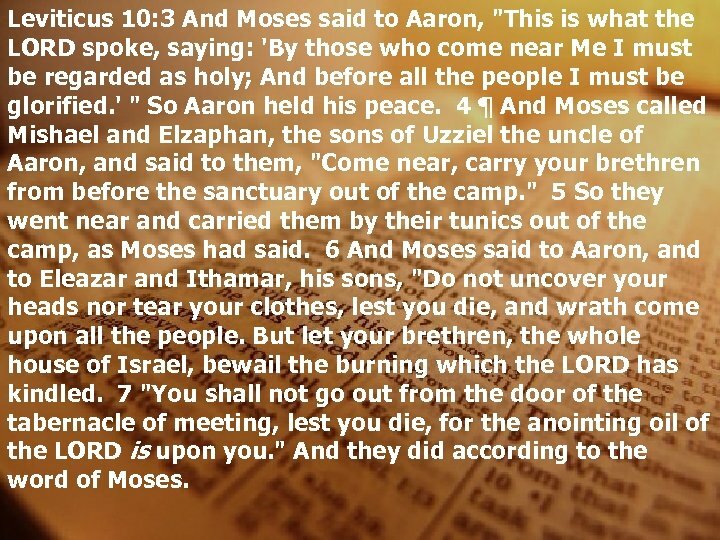 " So Aaron held his peace. 4 ¶ And Moses called Mishael and Elzaphan, the sons of Uzziel the uncle of Aaron, and said to them, "Come near, carry your brethren from before the sanctuary out of the camp. " 5 So they went near and carried them by their tunics out of the camp, as Moses had said. 6 And Moses said to Aaron, and to Eleazar and Ithamar, his sons, "Do not uncover your heads nor tear your clothes, lest you die, and wrath come upon all the people. But let your brethren, the whole house of Israel, bewail the burning which the LORD has kindled. 7 "You shall not go out from the door of the tabernacle of meeting, lest you die, for the anointing oil of the LORD is upon you. " And they did according to the word of Moses. 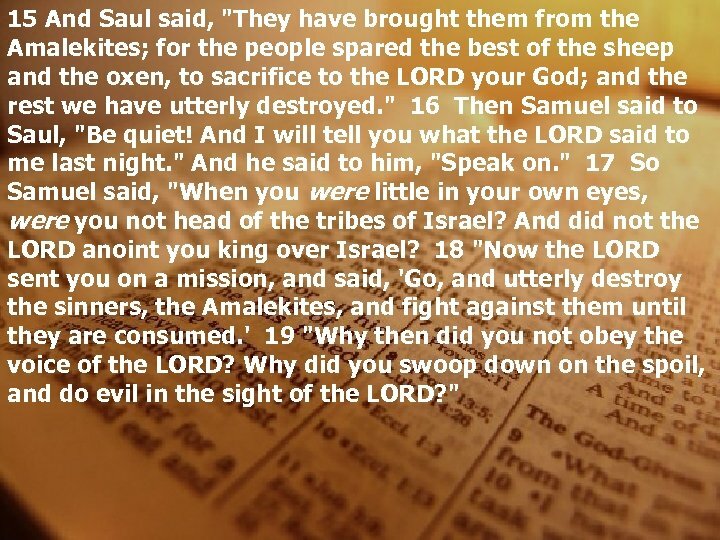 1 Samuel 15: 1 Samuel also said to Saul, "The LORD sent me to anoint you king over His people, over Israel. 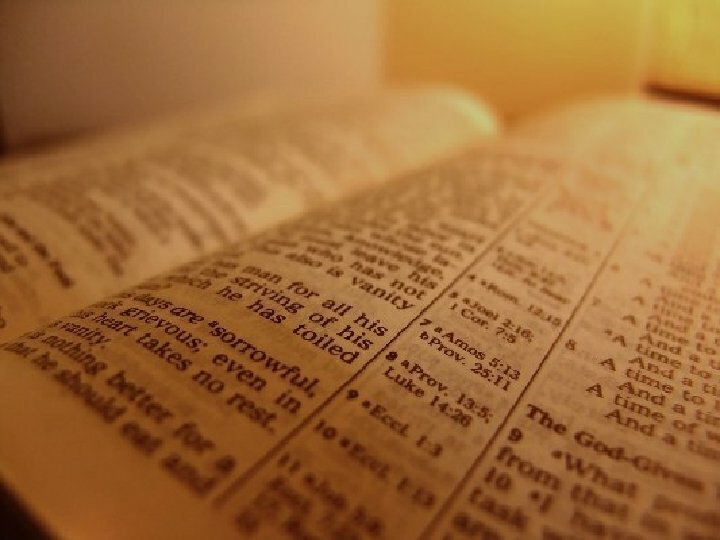 Now therefore, heed the voice of the words of the LORD. 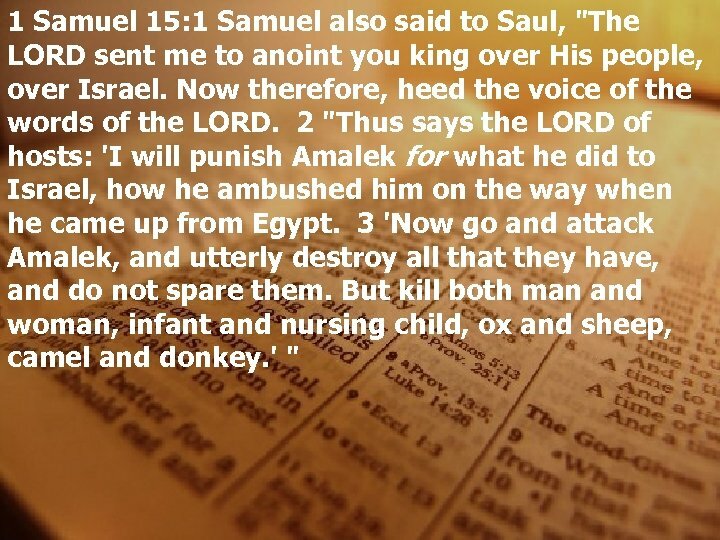 2 "Thus says the LORD of hosts: 'I will punish Amalek for what he did to Israel, how he ambushed him on the way when he came up from Egypt. 3 'Now go and attack Amalek, and utterly destroy all that they have, and do not spare them. But kill both man and woman, infant and nursing child, ox and sheep, camel and donkey. ' "
1 Samuel 15: 4 So Saul gathered the people together and numbered them in Telaim, two hundred thousand foot soldiers and ten thousand men of Judah. 5 And Saul came to a city of Amalek, and lay in wait in the valley. 6 Then Saul said to the Kenites, "Go, depart, get down from among the Amalekites, lest I destroy you with them. For you showed kindness to all the children of Israel when they came up out of Egypt. " So the Kenites departed from among the Amalekites. 7 And Saul attacked the Amalekites, from Havilah all the way to Shur, which is east of Egypt. 8 He also took Agag king of the Amalekites alive, and utterly destroyed all the people with the edge of the sword. 9 But Saul and the people spared Agag and the best of the sheep, the oxen, the fatlings, the lambs, and all that was good, and were unwilling to utterly destroy them. But everything despised and worthless, that they utterly destroyed. 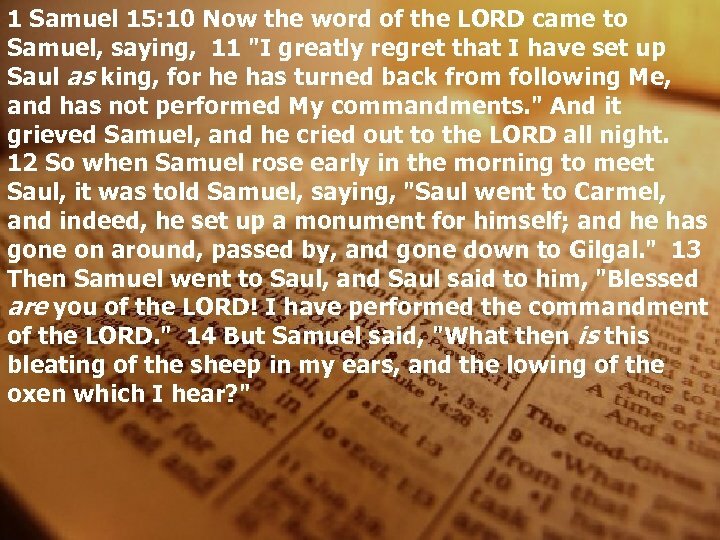 1 Samuel 15: 10 Now the word of the LORD came to Samuel, saying, 11 "I greatly regret that I have set up Saul as king, for he has turned back from following Me, and has not performed My commandments. " And it grieved Samuel, and he cried out to the LORD all night. 12 So when Samuel rose early in the morning to meet Saul, it was told Samuel, saying, "Saul went to Carmel, and indeed, he set up a monument for himself; and he has gone on around, passed by, and gone down to Gilgal. " 13 Then Samuel went to Saul, and Saul said to him, "Blessed are you of the LORD! I have performed the commandment of the LORD. " 14 But Samuel said, "What then is this bleating of the sheep in my ears, and the lowing of the oxen which I hear? " 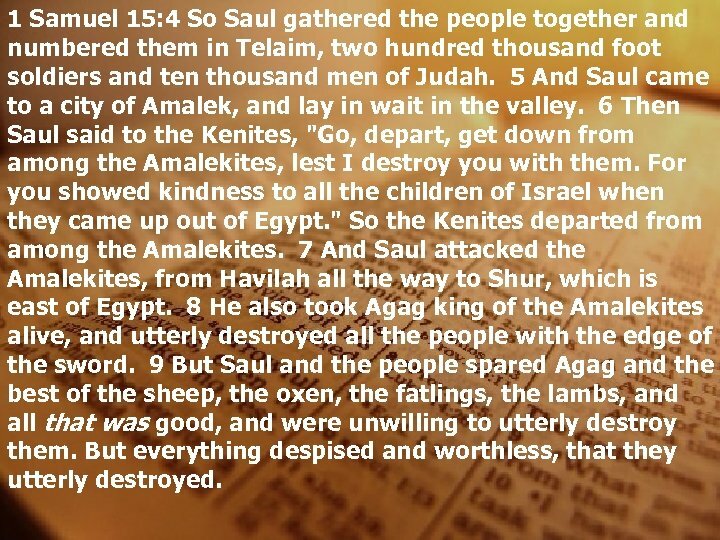 15 And Saul said, "They have brought them from the Amalekites; for the people spared the best of the sheep and the oxen, to sacrifice to the LORD your God; and the rest we have utterly destroyed. " 16 Then Samuel said to Saul, "Be quiet! And I will tell you what the LORD said to me last night. " And he said to him, "Speak on. " 17 So Samuel said, "When you were little in your own eyes, were you not head of the tribes of Israel? And did not the LORD anoint you king over Israel? 18 "Now the LORD sent you on a mission, and said, 'Go, and utterly destroy the sinners, the Amalekites, and fight against them until they are consumed. ' 19 "Why then did you not obey the voice of the LORD? Why did you swoop down on the spoil, and do evil in the sight of the LORD? " 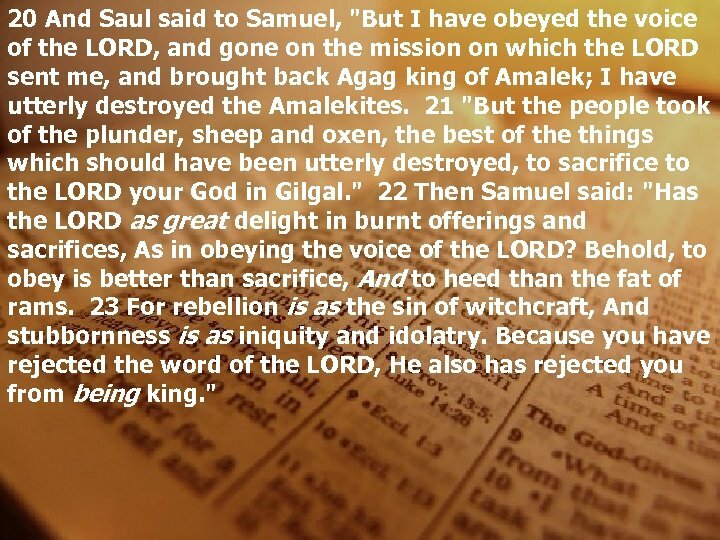 20 And Saul said to Samuel, "But I have obeyed the voice of the LORD, and gone on the mission on which the LORD sent me, and brought back Agag king of Amalek; I have utterly destroyed the Amalekites. 21 "But the people took of the plunder, sheep and oxen, the best of the things which should have been utterly destroyed, to sacrifice to the LORD your God in Gilgal. " 22 Then Samuel said: "Has the LORD as great delight in burnt offerings and sacrifices, As in obeying the voice of the LORD? Behold, to obey is better than sacrifice, And to heed than the fat of rams. 23 For rebellion is as the sin of witchcraft, And stubbornness is as iniquity and idolatry. Because you have rejected the word of the LORD, He also has rejected you from being king. " 1 Samuel 15: 35 And Samuel went no more to see Saul until the day of his death. 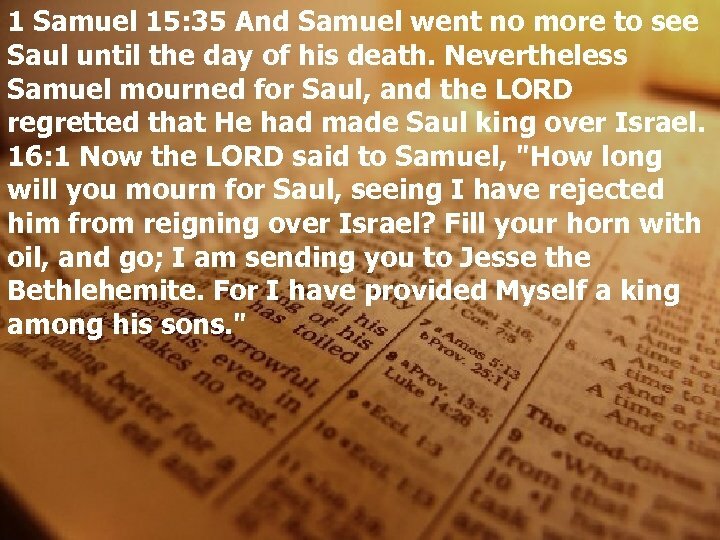 Nevertheless Samuel mourned for Saul, and the LORD regretted that He had made Saul king over Israel. 16: 1 Now the LORD said to Samuel, "How long will you mourn for Saul, seeing I have rejected him from reigning over Israel? Fill your horn with oil, and go; I am sending you to Jesse the Bethlehemite. For I have provided Myself a king among his sons. " Malachi 1: 6 " A son honors his father, And a servant his master. If then I am the Father, Where is My honor? And if I am a Master, Where is My reverence? Says the LORD of hosts To you priests who despise My name. Yet you say, 'In what way have we despised Your name? ' 7 "You offer defiled food on My altar. But say, 'In what way have we defiled You? ' By saying, 'The table of the LORD is contemptible. ' 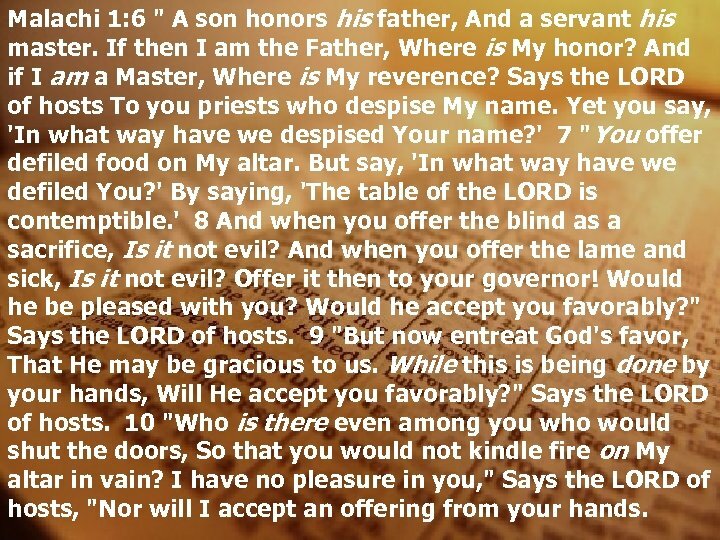 8 And when you offer the blind as a sacrifice, Is it not evil? And when you offer the lame and sick, Is it not evil? Offer it then to your governor! Would he be pleased with you? Would he accept you favorably? " Says the LORD of hosts. 9 "But now entreat God's favor, That He may be gracious to us. While this is being done by your hands, Will He accept you favorably? " Says the LORD of hosts. 10 "Who is there even among you who would shut the doors, So that you would not kindle fire on My altar in vain? I have no pleasure in you, " Says the LORD of hosts, "Nor will I accept an offering from your hands. 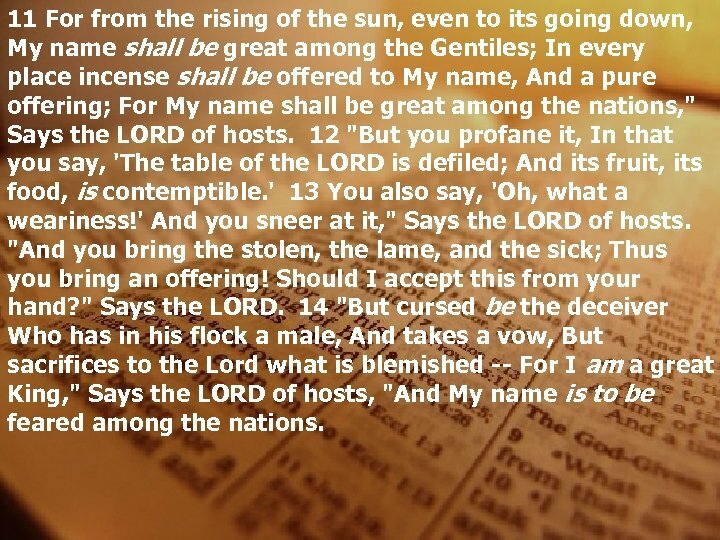 11 For from the rising of the sun, even to its going down, My name shall be great among the Gentiles; In every place incense shall be offered to My name, And a pure offering; For My name shall be great among the nations, " Says the LORD of hosts. 12 "But you profane it, In that you say, 'The table of the LORD is defiled; And its fruit, its food, is contemptible. ' 13 You also say, 'Oh, what a weariness!' And you sneer at it, " Says the LORD of hosts. "And you bring the stolen, the lame, and the sick; Thus you bring an offering! Should I accept this from your hand? " Says the LORD. 14 "But cursed be the deceiver Who has in his flock a male, And takes a vow, But sacrifices to the Lord what is blemished -- For I am a great King, " Says the LORD of hosts, "And My name is to be feared among the nations. 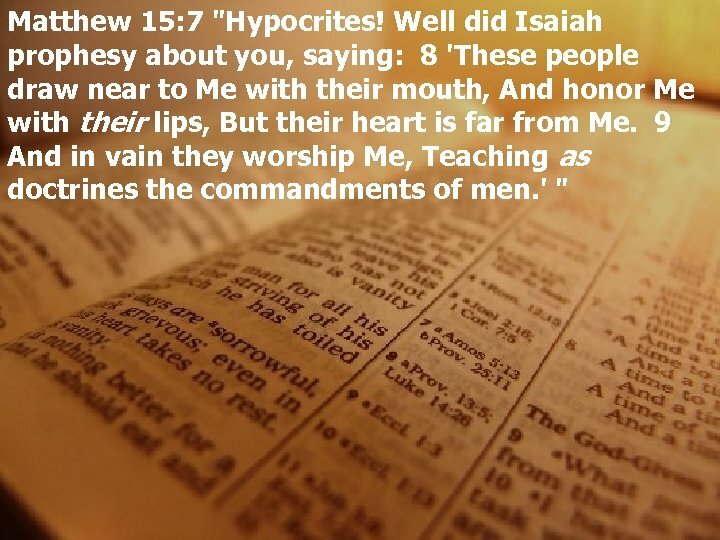 Matthew 15: 7 "Hypocrites! Well did Isaiah prophesy about you, saying: 8 'These people draw near to Me with their mouth, And honor Me with their lips, But their heart is far from Me. 9 And in vain they worship Me, Teaching as doctrines the commandments of men. ' 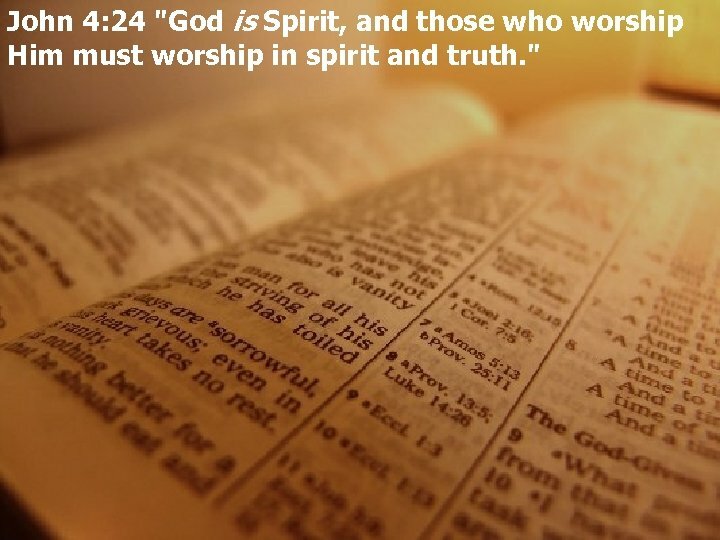 "
John 4: 24 "God is Spirit, and those who worship Him must worship in spirit and truth. " 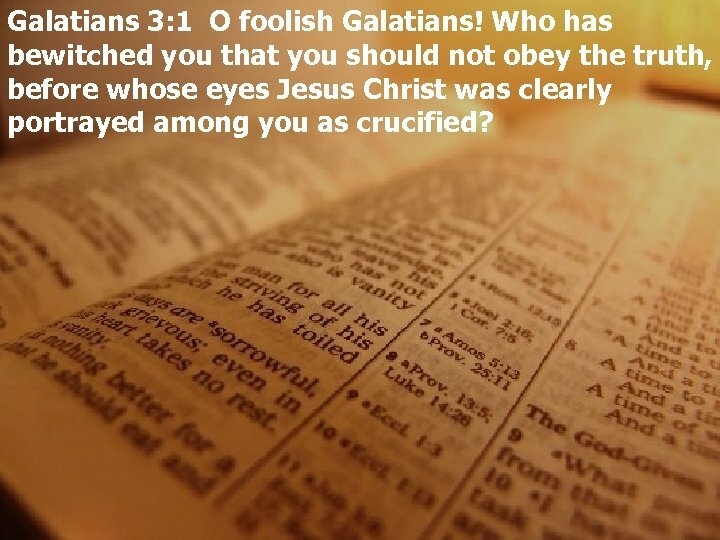 Galatians 3: 1 O foolish Galatians! Who has bewitched you that you should not obey the truth, before whose eyes Jesus Christ was clearly portrayed among you as crucified? 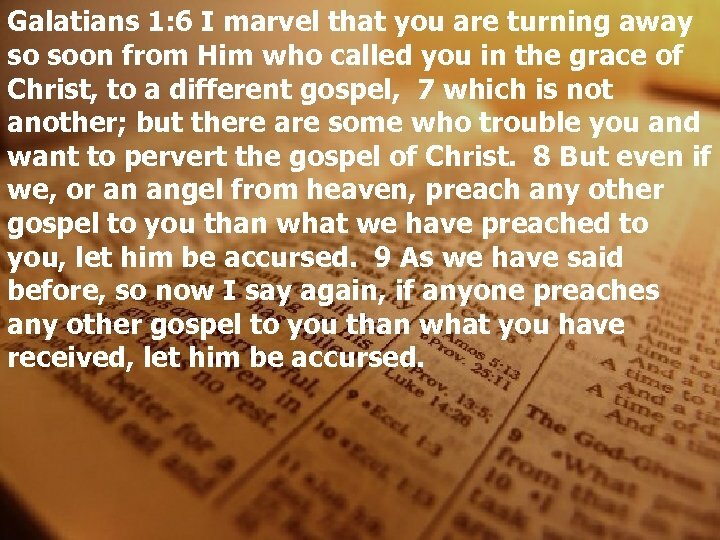 Galatians 1: 6 I marvel that you are turning away so soon from Him who called you in the grace of Christ, to a different gospel, 7 which is not another; but there are some who trouble you and want to pervert the gospel of Christ. 8 But even if we, or an angel from heaven, preach any other gospel to you than what we have preached to you, let him be accursed. 9 As we have said before, so now I say again, if anyone preaches any other gospel to you than what you have received, let him be accursed. 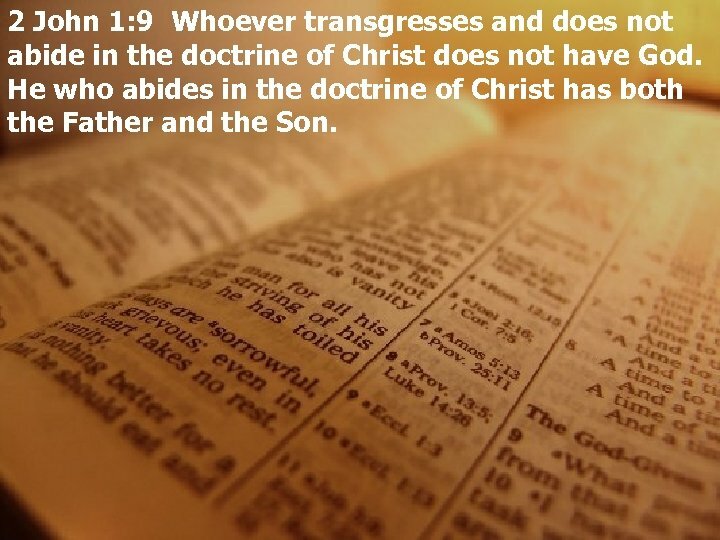 2 John 1: 9 Whoever transgresses and does not abide in the doctrine of Christ does not have God. He who abides in the doctrine of Christ has both the Father and the Son. 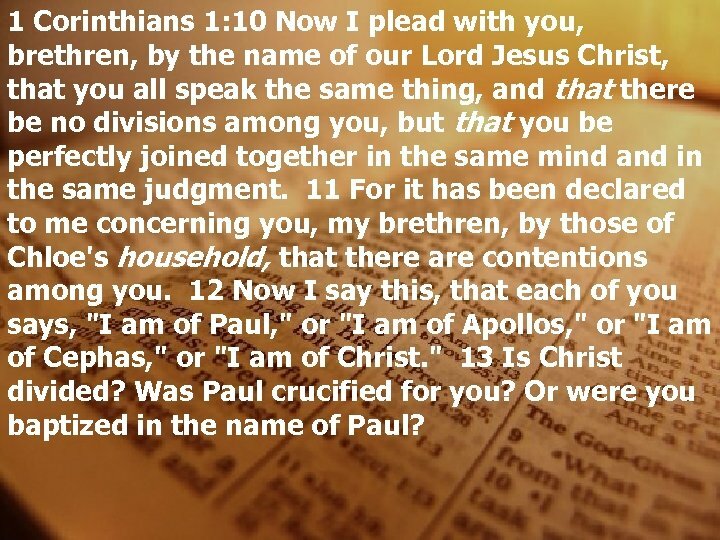 1 Corinthians 1: 10 Now I plead with you, brethren, by the name of our Lord Jesus Christ, that you all speak the same thing, and that there be no divisions among you, but that you be perfectly joined together in the same mind and in the same judgment. 11 For it has been declared to me concerning you, my brethren, by those of Chloe's household, that there are contentions among you. 12 Now I say this, that each of you says, "I am of Paul, " or "I am of Apollos, " or "I am of Cephas, " or "I am of Christ. " 13 Is Christ divided? Was Paul crucified for you? Or were you baptized in the name of Paul? Others are teaching that are many ways to heaven, but Jesus declared that there is only one way to heaven and it is through Him (Jn. 14: 6) and it is called a difficult road to travel that only a few will find (Mt. 7: 13 -14). 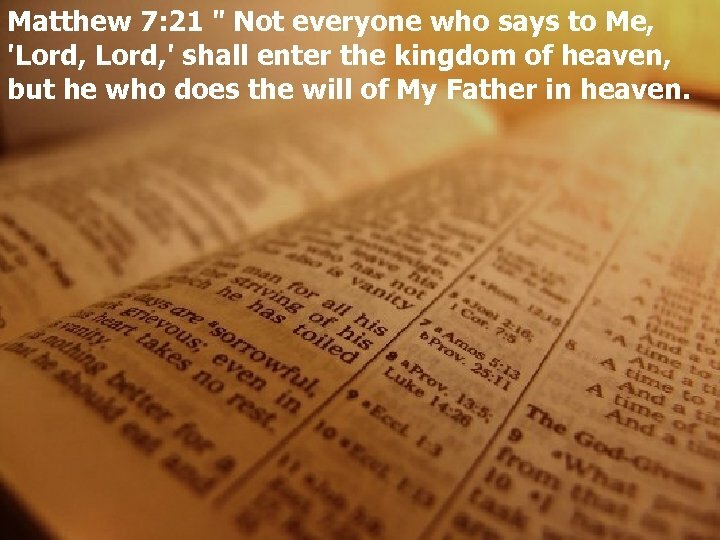 Matthew 7: 21 " Not everyone who says to Me, 'Lord, ' shall enter the kingdom of heaven, but he who does the will of My Father in heaven. 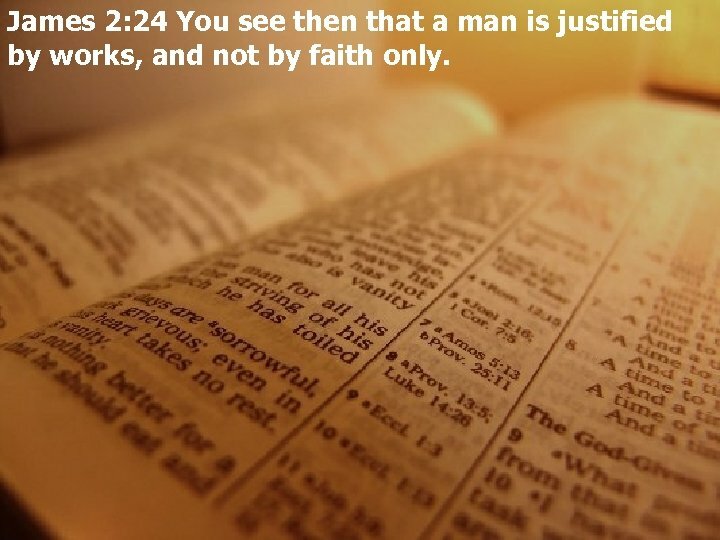 James 2: 24 You see then that a man is justified by works, and not by faith only. A quick look through Scripture shows that we must also repent (Lk. 13: 3), confess Jesus as Lord (Rom. 10: 9 -10) and be baptized to be saved (1 Pet. 3: 21). 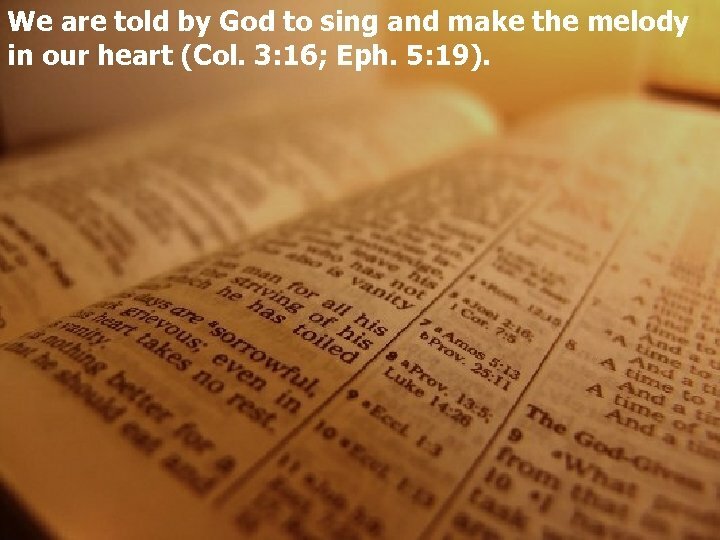 We are told by God to sing and make the melody in our heart (Col. 3: 16; Eph. 5: 19). ФРАЗОВЫЕ ГЛАГОЛЫ http: //www. azargrammar. com/grammar.